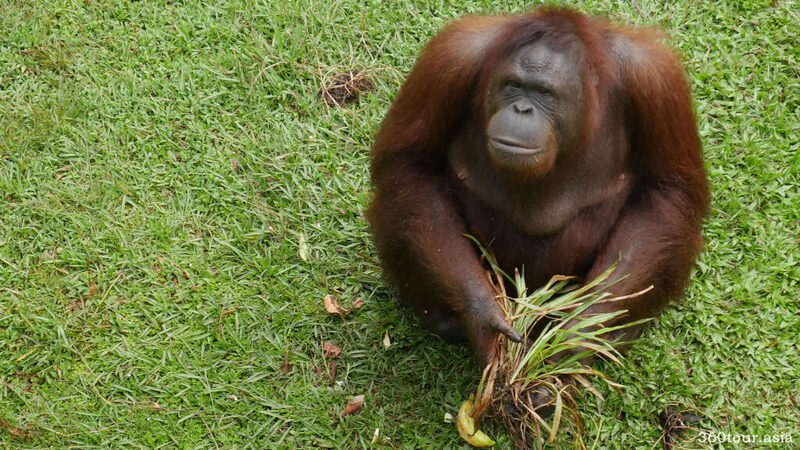 Matang Wildlife Centre is a place to meet endangered species of Borneo. Here you can find the Borneon Orangutan, Rhinoceros Hornbill, Malaysian Sun Bear, Sambar Deer and many more. This is also a Rehabilitation Centre for orangutan under orangutan adoption programme, where young orangutans, who were either orphaned or rescued from captivity, are taught how to survive in the wild. The welcome signage of the Matang Wildlife Centre featuring the Orangutan. Entrance Fee may subject to changes over time. The Matang Wildlife Centre is not a Zoo for animals but is a rehabilitation centre for various endangered wildlife. Endangered wildlife rescued are place in spacious cage and enclosure while the education is in progress. 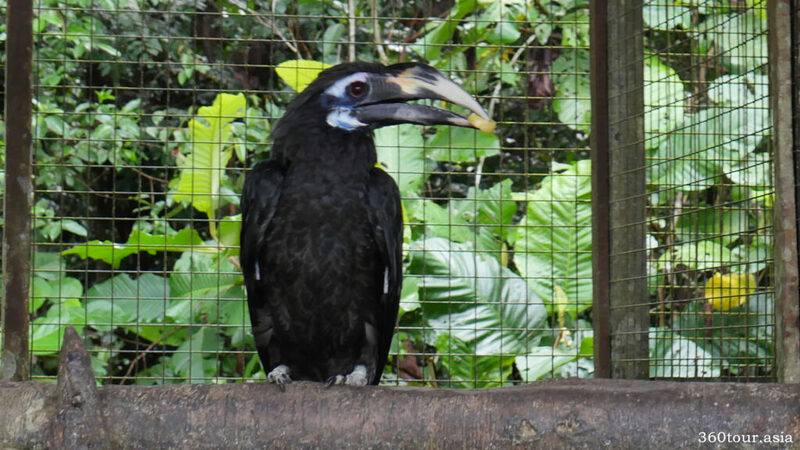 Visitors can have the chance to look at these semi-wild Endangered Species of Sarawak here. The centre’s 180 hectares of lowland forest also provides natural surroundings for orang utans and other local fauna. A walk in within the trail within the centre and you will see various different trees and plants, insects and other wildlife in the park.The air is fresh and the scenery is green. Other than day visits to the wildlife centre, you also have choice of overnight accommodation from chalets, to dormitory style lodges to camping sites where you can stay in your own tent. This is a favorite place for people who likes to stay close with nature. Ample amount of drinking water. The animals captivity in the centre are at a distance to each other, which requires much walking. However no food and drinks is allowed at the feeding area. Cameras for photographs. You can take memorable photos here, just ensure you don’t use flash on the animals. Insect and mosquito repellent. The national park is a preserved rainforest with native insects and bugs. Comfortable attire. Most of the journey in the park is within the rainforest with trails and wooden paths. Trekking suits, long sleeve and long trousers is encouraged. Sport shoes or trekking shoes in good condition. There will be allot of walking at the gravel road, natural trails and wooden walkway, which might be slippery after rain. Portable Battery Banks or USB chargers for your handphones. Just in case you ran out of battery while taking too much photos. There is no charging station for your portable devices in the park. Taking photos with the endangered species of Sarawak. Jungle trekking along the trails. Understand and learn various different types of plants and animals in the National Park. Awareness on important of conservation and rehabilitation of these endangered species. The Matang Wildlife Centre main office and information centre. Any person visiting Matang Wildlife Centre shall enter the center at his/her own risk. The Sarawak Government shall not be responsible for any physical, mental or emotional injury sustained or any loss of life or property whatsoever within Matang Wildlife Centre. – Controller of National Parks & Nature Reserves. The National Park is a Totally Protected Area. All visitors must observe the National Park and Natural Reserves Ordinance, 1998 and the National Parks and Natural Reserves Regulations, 1999. The prohibition is stated clearly at the entrance to the Matang Wildlife Centre. This is to ensure the safety of the animals and plants in the National Parks, and also the safety of the other visitors around. The condition of entry signage at the entrance to the Matang Wildlife Centre. There is no bus service to the Matang Wildlife Centre. When you use Taxi or Grab Car, do get their contacts for transportation back to Kuching City. There were usually no Taxi or Grab Car service nearby unless pre-booked return transport. You can also use your own transport to get to Matang Wildlife Centre. You can reach here via Jalan Akses FAC and Jalan Akses ke Wildlife Centre. There is a visitor parking area after you pass the guard house at the entrance. The better option is still getting here by tour bus via tour agency. There is several places of interest at Matang area near the Wildlife Centre. They will usually provide a scheduled tour around Matang Area. We have a tour along the Animal Enclosure Trail, which is one of the tourist attraction here. It is much recomended for those who wish to have a short day trip at Matang Wildlife Centre. Traveling along this trail along the broadwalk in the nature rainforest allows you to see some of the Endangered species in captivity in enclosure that is next to the forest. Those animals in enclosure is all been confiscated and kept here for rehabilitation. These animals was previously kept in captivity for protracted periods of time and mostly lost their ability to survive in the wild. After successful rehabilitation, these animals will be released back to the wild. The two major rehabilitation program here is the Sun Bear Rehabilitation Program and Orangutan Rehabilitation Program. Walking towards the Animal Enclosure Trails. Occasionally you can find orangutans roaming around the forest. These are the released Orangutans in the National Park. Please keep your distance from the orangutan. Be at least 6 meter or 20 feet from the orangutan. Food and drinks are not allowed at the feeding area. Smoking is totally prohibited in non-smoking zones. Avoid staying under the orangutan when they are over head. The warning on the result of the orangutan attack. There is also reminder notice at the entrance to the Animal Enclosure Trails. Keep your noise to the minimum. Do not throw your litter into the animal enclosure. Avoid taking picture with flashlight. Do not attempt to touch the animals. The entrance to the Animal Enclosure Trail. The Animal Enclosure Trails takes visitors into natural rainforest. The plankwalk can be slippery after rain. The crocodile in the water. The crocodile resting on the ground. The porcupine feeding on long beans. The aviary where the birds are kept. The wall mural of three orangutan on a Mitsubishi Triton. More murals around the orangutan enclosure. The trail continues into the forest. 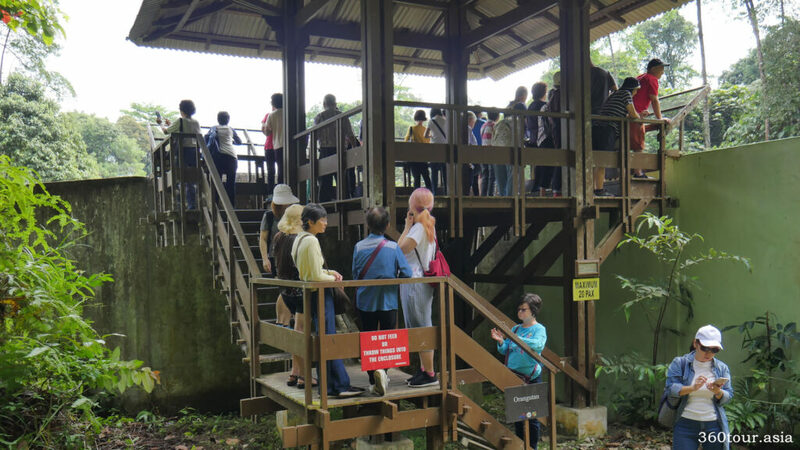 The observation deck to observe the orangutan rehabilitation enclosure. The orangutan on the platform. The adult orangutan looking at you. The trails continues into the rainforest. The Sun Bear hunting for food. The tall rainforest trees along the trails. Overall the trip in Matang Wildlife is quite enjoying. It is a good opportunity to venture into the protected rainforest and indulge in the greenery.